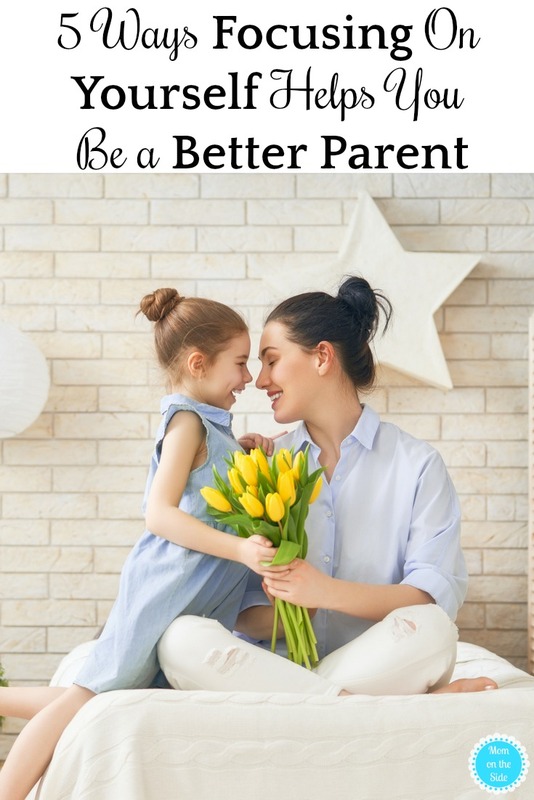 Here are 5 ways focusing on yourself helps you be a better parent. Self-care. It’s something that many moms miss, but that we (for whatever reason) view as being selfish. However, there is a big difference between being selfish and simply making your wellbeing a priority. Self-care is really about taking care of yourself so that you are the happiest, healthiest version of you. When you do that, you are better equipped to be the mom that your kids deserve- without feeling like you’re going to fall apart at the seams. Let’s be honest – mommy brain is most definitely a thing. We often juggle so many hats (mom, wife, daughter, sister, friend, employee, etc) that it’s easy to become frazzled. We forget anything that’s not written down. Or we lose the list of things we DID write down (come on, that can’t just be me, right?). It’s easy to get to the point where we feel like we are drowning in a sea of overwhelm. And the more overwhelmed we feel, the more counterintuitive it may seem to take a step away from it all. We feel like we just have to follow Dory’s and “keep on swimming”. Eventually, we will get where we are going. Right? However, what would serve us better is if we take a break. An intentional break. One where we put aside our to-do lists and worries for a little bit and focus on doing something solely because it brings us joy, peace, or both. By taking that moment to breathe, we allow ourselves a bit of mental clarity. That mental clarity can help to reinvigorate us to tackle our to-do’s with more energy and excitement. Some great self-care rituals to improve your mental clarity include journaling and doing yoga. However, taking any kind of break to do something you enjoy is a good thing. Speaking of yoga, self-care can also go a great way towards improving your physical health. Engaging in exercises such as yoga, pilates, Zumba, walking/jogging/running, swimming, and cycling can help you to achieve a healthy weight, improve your cholesterol, lower your blood pressure, and all of those other things that help you to live a physically healthy life. The healthier you are, the more time and energy you can devote to being physically active with your children without feeling winded or exhausted long before your kids. Of course, since we are talking about the different kinds of health, I have to mention emotional health. 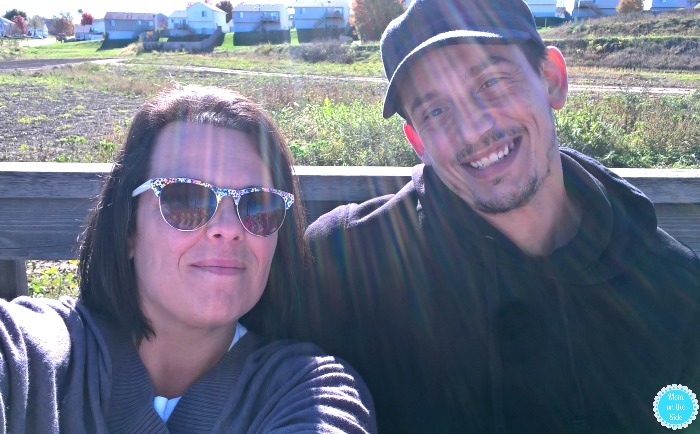 Sometimes, when we feel overwhelmed by all of the responsibilities and stressors that come not only with parenting but with adulting and life in general, we become on edge. We are more irritable with our loved ones and are more likely to do things we don’t like to do – like raise our voice at our children or say things that we don’t mean. By making self-care a priority, we can lower our overall stress levels so that we can be more like the moms that we want to be – peaceful, kind, and patient. Journaling about your emotions can be a great way to pay attention to your emotional health. So can making time to hang out with your friends, away from your kids. This gives you the opportunity to vent if you need to and to blow off some steam. Don’t feel guilty about it, either! As Shrek would say: “better out than in”. I can’t think of a single mom who doesn’t need to vent every once in a while Even if it’s just about the inevitable neverending pile of laundry. Self-care can also do wonders for keeping your marriage or relationship on track. Taking time to yourself to do things you enjoy can help you to feel refreshed and renewed. Having a spouse or partner who supports your self-care can help foster a deeper love and appreciation. Also, don’t forget that date nights still count as self-care! The happier your relationship is, the better equipped the two of you are to raise happy children. 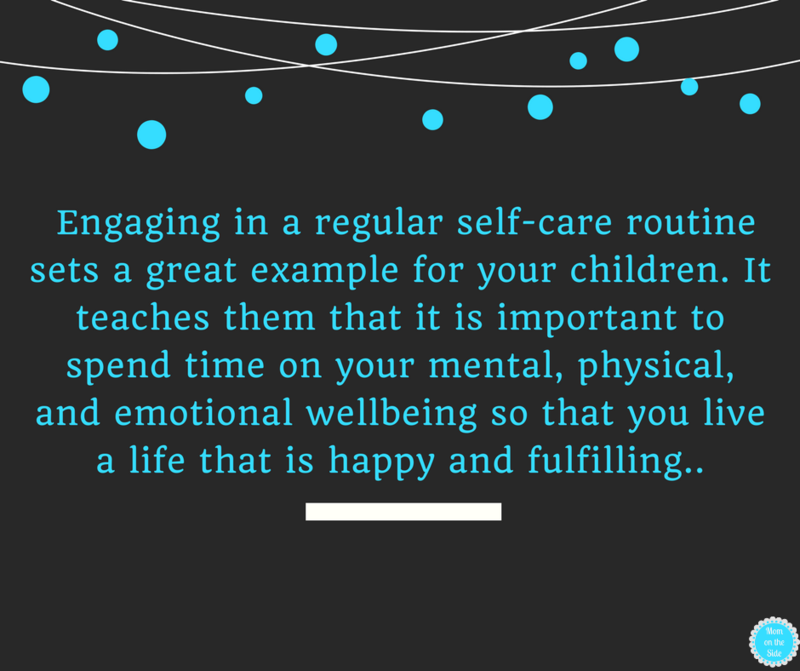 Last, but certainly not least, engaging in a regular self-care routine sets a great example for your children. It teaches them that it is important to spend time on your mental, physical, and emotional wellbeing so that you live a life that is happy and fulfilling. It teaches them about the importance of finding a good balance between the various aspects of your life- without losing your identity to either one. By being open and consistent about your self-care needs (for example, telling your kids that every Sunday afternoon from 2-4pm is your “me time”), they will make the connection between taking “me time” and happiness levels. They will learn that taking time to oneself on a regular basis is a good thing. If they learn that now, they may hold on to that when they go off into the real world- with all of its stressors. Plant the seeds now so that you can raise children who become balance and happy adults. What is your favorite form of self-care? I’d love to hear about it. Just let me know in the comments below.